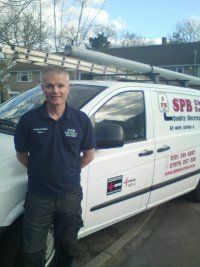 Welcome to SPB Electrical Services Ltd, your one-stop shop for domestic and commercial electrical services across Birmingham and the surrounding areas. We’re proud to offer a professional, accredited service and a team of electricians who ensure all work carried out meets the latest industry regulations. Whether you are looking to modify an existing installation or design and fit new electrical installations from scratch, we have the experience and skills to complete your projects to the highest levels of quality and safety. We welcome enquiries from all sectors of industry and domestic customers – even offering a discount for OAPs! Please contact us today if you’d like more information or to request a quotation. At SPB Electrical we’re proud to be keeping the workplaces of Birmingham safe from faulty electrical equipment and wiring. By carrying out PAT testing on your portable appliances such as computers and peripherals we can help you to provide a safe working environment for your employees. To find out more about our full range of services please contact us on 0121 241 6287. Why not call us today on 0121 241 6287 and become another happy customer of SPB Electrical.